Although we have crocuses blooming -- at last -- it was not exactly balmy for the 2011 Presidents' Day edition of Cornbread Suppers. Even so, we cleaned the winter dust off the porch table and chairs, and lit the outside candle. Sure enough, out of the large crowd of Cornbreadians who came to Supper, quite a few made their way onto the porch for play and fresh air February dining. 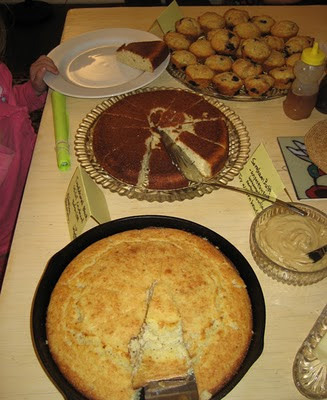 Monday holidays bring people to Cornbread Supper who have regular obligations on other Mondays. The mix keeps mixing, and is fine and invigorating. Or maybe that was the Kombucha and the delightful spices in this week's foods. Kale, squash, white beans, onions, etc. Apple Sauce from Our Tree! Gallo Pinto ~ Costa Rica ~ Rice, beans, chicken, cilantro, garlic, ginger, celery, peppers, whatever!